Fidel Castro sought to oust liberals and democrats, such as José Miró Cardona and Manuel Urrutia Lleó. In February professor José Miró Cardona had to resign because of Castro's attacks. 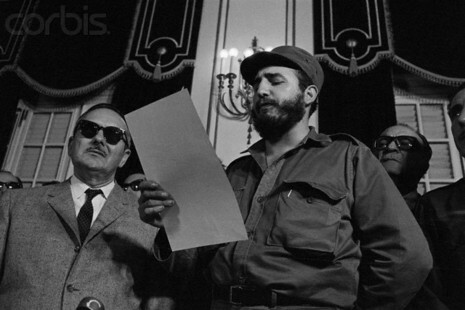 On February 16, 1959, Castro was sworn in as Prime Minister of Cuba. Professor Miró soon went into exile in the United States, and would later participate in the Bay of Pigs Invasion against Castro's form of government. President Manuel Urrutia Lleó wanted to restore elections, but Castro opposed free elections. Castro's slogan was "Revolution first, elections later". The new government began expropriating property and announced plans to base the compensation on the artificially low property valuations that the companies themselves had kept to a fraction of their true value so that their taxes would be negligible. During this period Castro repeatedly denied being a communist. For example in New York on April 25 he said, "...[communist] influence is nothing. I don't agree with communism. We are democracy. We are against all kinds of dictators... That is why we oppose communism." Between April 15 and April 26, Castro and a delegation of industrial and international representatives visited the U.S. as guests of the Press Club. Castro hired one of the best public relations firms in the United States for a charm offensive visit by Castro and his recently initiated government. Castro answered impertinent questions jokingly and ate hot dogs and hamburgers. His rumpled fatigues and scruffy beard cut a popular figure easily promoted as an authentic hero. He was refused a meeting with President Eisenhower. After his visit to the United States, he would go on to join forces with the Soviet leader, Nikita Khrushchev. On February 16, 1959, Fidel Castro is sworn in as prime minister of Cuba after leading a guerrilla campaign that forced right-wing dictator Fulgencio Batista into exile. Castro, who became commander in chief of Cuba's armed forces after Batista was ousted on January 1, replaced the more moderate Miro Cardona as head of the country's new provisional government. In 1951, he ran for a seat in the Cuban House of Representatives as a member of the reformist Ortodoxo Party, but General Batista seized power in a bloodless coup d'etat before the election could be held. Various groups formed to oppose Batista's dictatorship, and on July 26, 1953, Castro led some 160 rebels in an attack on the Moncada Barracks in Santiago de Cuba--Cuba's second largest military base. Castro hoped to seize weapons and announce his revolution from the base radio station, but the barracks were heavily defended, and more than half his men were captured or killed. Two years later, Batista felt confident enough in his power that he granted a general amnesty for all political prisoners, including Castro. Castro then went with his brother Raul to Mexico, and they organized the revolutionary 26th of July Movement, enlisting recruits and joining up with Ernesto "Che" Guevara, an idealist Marxist from Argentina. On December 2, 1956, Castro and 81 armed men landed on the Cuban coast. All of them were killed or captured except for Castro, Raul, Che, and nine others, who retreated into the Sierra Maestra mountain range to wage a guerrilla war against the Batista government. They were joined by revolutionary volunteers from all over Cuba and won a series of victories over Batista's demoralized army. Castro was supported by the peasantry, to whom he promised land reform, while Batista received aid from the United States, which bombed suspected revolutionary positions. By mid-1958, a number of other Cuban groups were also opposing Batista, and the United States ended military aid to his regime. In December, the 26th of July forces under Che Guevara attacked the city of Santa Clara, and Batista's forces crumbled. Batista fled for the Dominican Republic on January 1, 1959. Castro, who had fewer than 1,000 men left at the time, took control of the Cuban government's 30,000-man army. The other rebel leaders lacked the popular support the young and charismatic Castro enjoyed, and on February 16 he was sworn in as prime minister. The United States initially recognized the new Cuban dictator but withdrew its support after Castro launched a program of agrarian reform, nationalized U.S. assets on the island, and declared a Marxist government. Many of Cuba's wealthier citizens fled to the United States, where they joined the CIA in its efforts to overthrow Castro's regime. In April 1961, with training and support by the CIA, the Cuban exiles launched an ill-fated and unsuccessful invasion of Cuba known as the "Bay of Pigs." The Soviet Union reacted to the attack by escalating its support to Castro's communist government and in 1962 placed offensive nuclear missiles in Cuba. The discovery of the missiles by U.S. intelligence led to the tense "Cuban Missile Crisis," which ended after the Soviets agreed to remove the weapons in exchange for a U.S. pledge not to invade Cuba. Castro's Cuba was the first communist state in the Western Hemisphere, and he would retain control of it into the 21st century, outlasting 10 U.S. presidents who opposed him with economic embargoes and political rhetoric. After the collapse of the Soviet Union in 1991, Castro lost a valuable source of aid, but he made up for it by courting European and Canadian investment and tourism. In July 2006, Castro temporarily ceded power to his brother Raul after undergoing intestinal surgery. His struggles with illness continued, and he officially stepped down in February 2008.